winter really seems like eons ago now that summer has arrived with a vengeance. it close to 24 degrees outside, the sky is bright blue and the lazy cats are enjoying the shade on the balcony. the new balcony, i should add, since one of the reasons for my blogging (and knitting) absence has been that we have moved. from a very nice flat to an even nicer one! this one has a wood burning fire place (not lit now, obviously) and an extra room for all of my knitting and sewing and generally crafty stuff! i just love it here! there’s still a lot of stuff that we have to do in our new home, and we’ll be using most of our summer vacation for putting up wallpaper, painting and putting up new shelves (and boy, do we need them!). but we’ve basically settled in, which has brought my inspiration back. the other day i had the desperate urge to knit, and knit something simple. 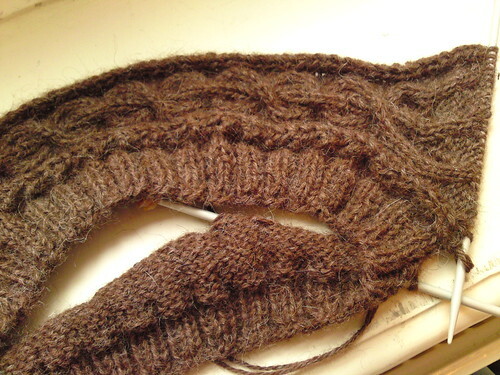 i remembered my old hourglass jumper (from last minute knitted gifts) which i almost never use because it turned out too tight, and there are also a few mistakes in the neck decreases. well, it’s a shame to let good yarn to go waste, so i frogged it! 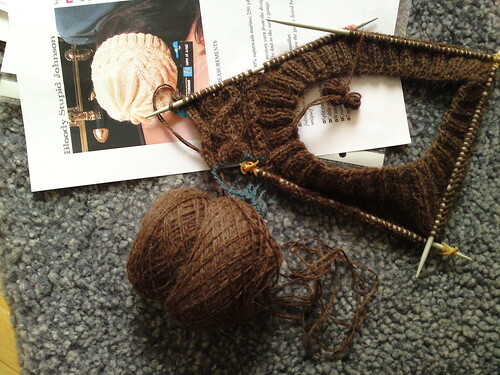 and i’ve now started over with larger needles and a larger size. my idea for this jumper was always that i wanted it to be slightly too big and something for me to snuggle up in during autumn or even on a late, chilly summer evening. well, my first take on it didn’t fit the bill. but i have great hopes for it this time. bloody stupid johnson! no, the hat! 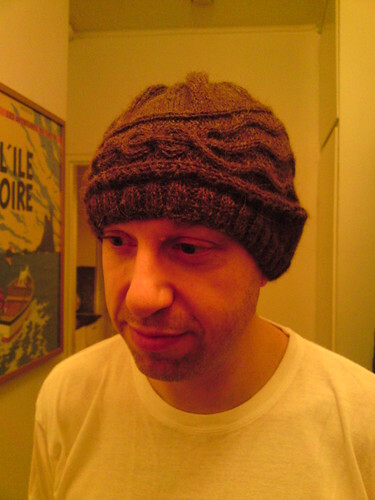 a fun and enjoyable knit that turned into a warm and cozy hat with a very nice design. as you can see i have not bothered with washing the frogged wool and stretching it, hence the curly yarn and somewhat bubbly jumper. 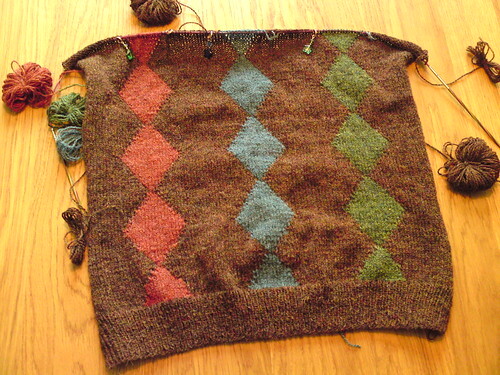 i will of course block the jumper once it’s finished, and the bubblyness (?) doesn’t bother me. i have to show you the new home for my yarn basket!